The Carolina Panthers could have one of the league’s most exciting and creative offenses in football in 2017. They have been unique for some time now with Cam Newton at QB and the things that he is capable of doing and they are prepared to allow him to do in terms of carrying the football. No other team in football runs QB-Power with any kind of regularity – a bruising, between-the-tackles run into the teeth of a defense – but the Panthers do it with Newton. They went big in the draft with versatile playmakers, snagging Stanford’s Christian McCaffrey in the first round and then Ohio State’s Curtis Samuel in the second. 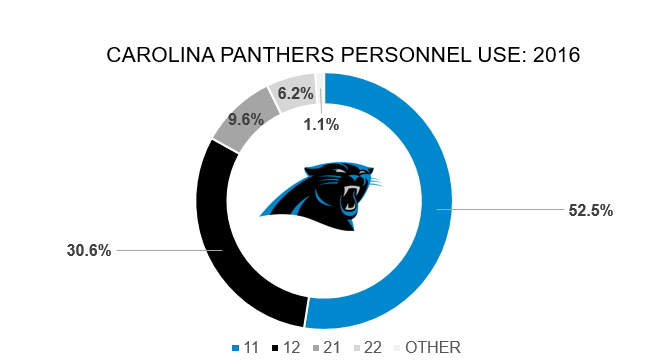 Each player has been employed across a couple of different positions in college, but it is their skill sets that allows the Panthers to get exceptionally creative with their offensive personnel in the NFL, and become the hardest offense to match up with any defense is going to come across. The Panthers are, by and large, a one-back offense. Over the past two seasons they have had one back on the field in 11 or 12 personnel (one back, one TE, or one back, two TEs) on 81.9 percent of their snaps. 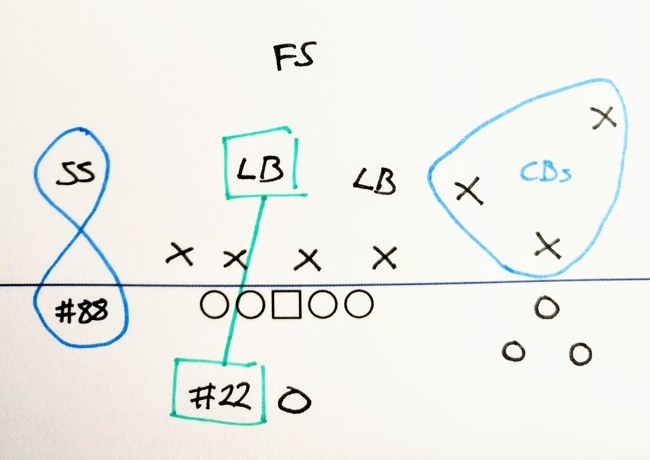 The complexity that these versatile weapons gives them is not having both in the backfield at the same time, but in what the team can do from a motion standpoint to create mismatches with the defense. 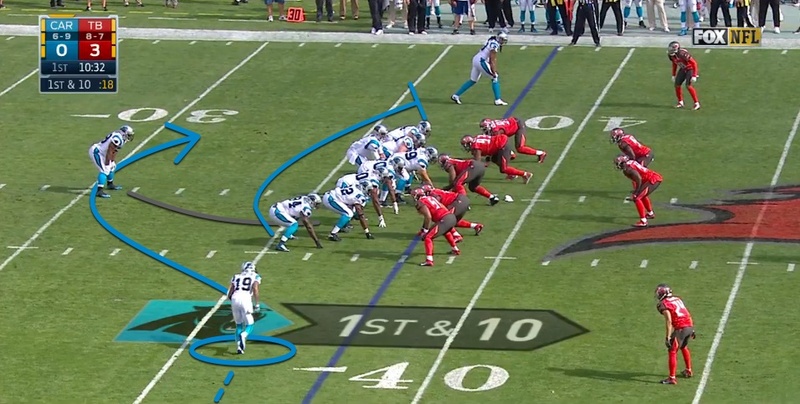 Here the Panthers have already created a mismatch in personnel by splitting TE Greg Olsen out to the left of the formation while the WRs form a bunch formation on the other side. The defense (Tampa Bay in this case) has elected to defend the receivers with their corners and bring the strong safety across to cover Olsen one on one as if he was a corner. This is a mismatch the Panthers exploited for an easy completion and a first down. Now imagine the running back is Christian McCaffrey, and he is automatically matched up against a linebacker. Even if he is just used out of the backfield that’s a favourable matchup, but if they put him in motion and line him up outside Olsen at wide receiver, the Bucs suddenly find themselves with their middle linebacker playing one on one on an island with a player that could play like a true wide receiver. Now add in the wrinkle of Curtis Samuel. The Panthers ran 14 reverses, end arounds or jet sweeps last season, and all of them went to Ted Ginn, to try and take advantage of his speed and ability in space. Samuel can replicate that role, and bring the extra versatility of being able to line up in the backfield. Samuel averaged 7.9 yards per carry last season on 97 carries for the Buckeyes, with 3.2 of those yards on average coming after contact. He forced 20 missed tackles (one every 4.9 carries) and was a legitimate backfield weapon. At 5-foot-11 and under 200 pounds, his future in the NFL is at receiver, but he has the speed (4.31 40 time at the combine, faster than Ginn’s 4.37) to replicate Ginn’s big-play threat on these manufactured touches. 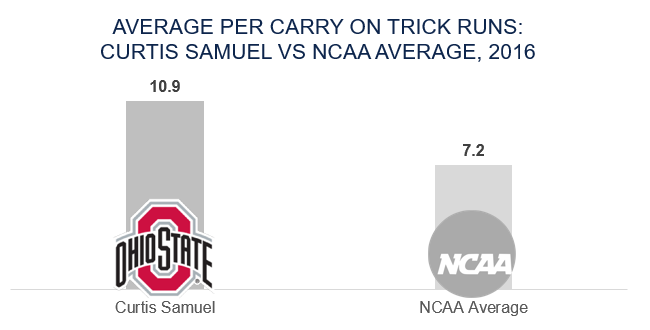 Ginn averaged seven yards per carry on the 14 trick runs he had in 2016, but Samuel at Ohio State averaged 10.9, more than three yards higher than the NCAA average on those plays. With Samuel able to run the speed role that Ginn was used in for the Panthers in the past, the team shouldn’t lose any big-play threat in that regard, and it comes with extra versatility in the backfield in the shape of McCaffrey. But the key again becomes what the position versatility of those two players allows the Panthers to do from a matchup standpoint. Samuel isn’t just a threat to come in motion and run a trick play or not, he could also suddenly be brought into the backfield, and McCaffrey sent out to line up at wide receiver or in the slot in his place, forcing the defense into a quick re-shuffle or switch in assignments. Defenses are going to have to decide before the huddle what they are treating Samuel and McCaffrey as when it comes to personnel (likely receiver and running back, respectively), but that puts them in a potential bind from a matchup standpoint because each player is capable of playing the opposite role better than any defender they are going to be matched up with. With Newton under center, the Panthers already have one of the league’s most unique and versatile offensive weapons. They added two more in the first two rounds of the draft, and now have several months to dream up creative ways of using all three together.